Trusted.Sale is an organization dedicated to facilitating safe interactions and transactions. Trusted.Sale’s anti-fraud, anti-scam transaction platform enables buyers and sellers to safely transact with confidence. Trusted.Sale enables safe-selling in all peer-to-peer purchase environments – including, but not limited to, classified ads, online marketplaces, and mobile apps. To learn more, visit Trusted.Sale or follow Trusted.Sale on Twitter and Facebook. Using Trusted.Sale, sellers can attract more buyers, which means they have a better chance of getting the most value for their cars. Selling a car privately brings in 15-35% more cash than a trade-in. Meanwhile, buyers can safely and conveniently buy items in private sales, meaning they can pay less than they would through a dealership or retail store. Everybody wins and everybody stays safe. 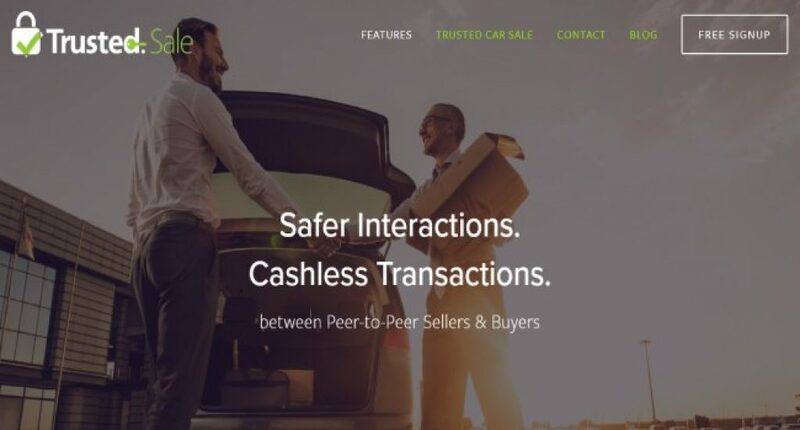 The Trusted.Sale platform is designed to make in-person peer-to-peer transactions safer and more secure including, but not limited to, transactions that stem from online marketplaces and classified ads. The goal of the platform is to reduce scams and fraud while increasing benefits for the buyer and the seller. Trusted.Sale verifies the identity and contact information of both parties to reduce the risk associated with meeting an anonymous buyer or seller. The platform manages the secure transfer of money from the buyer to the seller, creating a cashless transaction. Buyers can schedule meet-ups without fear of carrying large amounts of cash on their person. Buyers and sellers that exchange money or goods without any form of a middleman. For example, people wishing to sell their car in a private sale, without using a dealership. There is no other platform like this in the space. Beyond the safety and security benefits, the platform includes benefits such as financing, which previously wasn’t available in private sales and required a store, pawn shop or dealership to act as a middleman. Now, sellers can sell their car for the full private sale value of the vehicle without fear of fraud. Plus, buyers can safely finance used vehicles, meaning they can pay less than they would through a dealership without having to pay the full price of the car in one lump sum. Plus the platform helps with all of the paperwork. Trusted.Sale was a finalist in the Atlanta Startup Battle, edging out over 500 other applicants. We’re currently launching the pilot program and plan to make the platform available for all users in a few months. Paul is a serial entrepreneur and senior sales and marketing executive, with over 20 years of practical, hands-on strategic marketing planning, implementation, and senior leadership experience. Paul has helped build start-ups from the ground up, and emerging companies and established market leaders alike to attract more prospects, and convert these prospects into profitable customers. Paul has extensive experience and thought leadership in the areas of digital and interactive marketing strategy, interactive marketing campaign management including functional expertise in campaign planning, development, execution, reporting, analysis, and optimization.